Gates of Madness is a massive set of doors that serve as the only method of entering the Isles from The Fringe (quest-related). Guarded by the Gatekeeper, these gates provide access from The Fringe into the Isles proper. There is one leading to Mania and one to Dementia. 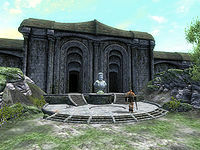 They serve as a barrier into the realm, only allowing those permitted by Sheogorath to pass. The Gates of Madness also appear as a card in Legends.